Pajau (၂၀၀၅ အထိ) ကချင်ပြည်နယ် ကချင်လွတ်လပ်ရေးအဖွဲ့၏ လက်နက်ကိုင်အဖွဲ့ဖြစ်ပြီး ညီညွတ်သော တိုင်းရင်းသားလူမျိုးများ ဖက်ဒရယ်ကောင်စီ (UNFC) အဖွဲ့ဝင် ဖြစ်သည်။ Holds and governs territory in Kachin State. 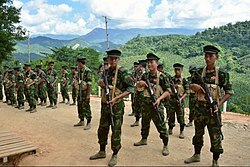 ↑ "Burma attack breaks Kachin truce near China border"၊ BBC၊ 20 January 2013။ 18 August 2014 တွင် ပြန်စစ်ပြီး။ "The rebels are seeking greater autonomy within Burma for ethnic Kachins who have had de facto control over a part of northern Burma for more than 50 years." ↑ Johnson, Tim (29 August 2009). China Urges Burma to Bridle Ethnic Militia Uprising at Border. The Washington Post. Myanmar Peace Monitor – NGO based in Chaing Mai, Thailand that monitors Myanmar's ongoing peace process. Pyidaungsu Institute – Political institute based in Chaing Mai, Thailand focused on achieving political stability and peace in Myanmar.